The North Korea summit may be back on again after both North Korean leader Kim Jong Un and U.S. President Donald Trump appeared open to the possibility of keeping their date to discuss denuclearization on June 12. It's not North Korean leader Kim Jong-un, but Australian-Chinese impersonator Howard X, who was up to his old tricks Sunday as he took a stroll down Jubilee Bridge in Singapore, overlooking the Marina Bay Sands Hotel and the landmark Merlion. The Washington Post reported that the USA delegation to the Panmunjom meeting - in the Demilitarized Zone between North and South Korea - was led by Sung Kim, a former United States ambassador to South Korea and former nuclear negotiator with the North. Trump tweeted a day after he and Kim separately expressed willingness to meet June 12 in Singapore as originally planned, after the US leader abruptly canceled the summit on Thursday, citing the North's "open hostility". Trump said Saturday that conversations about a potential summit were "going along very well". "It's moving along very nicely", Trump said at the White House on Saturday. Moon met Trump in Washington on Tuesday in an effort to keep the US-North Korea summit on track. "By agreeing to a leadership summit with Kim, Donald Trump gave away a good deal of America's leverage in exchange for nothing in return from the North Koreans", wrote Jamie Metzl, senior fellow in Atlantic Council's Scowcroft Center for Strategy and Security. But less than 24 hours later, Trump said the June 12 meeting would still be possible. "It has a chance to be a great, great meeting for North Korea and a great meeting for the world", he said. Former US ambassador to South Korea and nuclear negotiator with the North, Sung Kim, was recalled from his post as Philippines ambassador to lead the preparations, US media reported Monday morning. The two delegations are focused on the substance of any summit between the Trump and Kim Jong Un: the issue of North Korea's nuclear weapons program. On Friday, Trump revealed that North Korea had sent a "warm and productive" statement and said that the planned June 12 summit may still happen as scheduled. 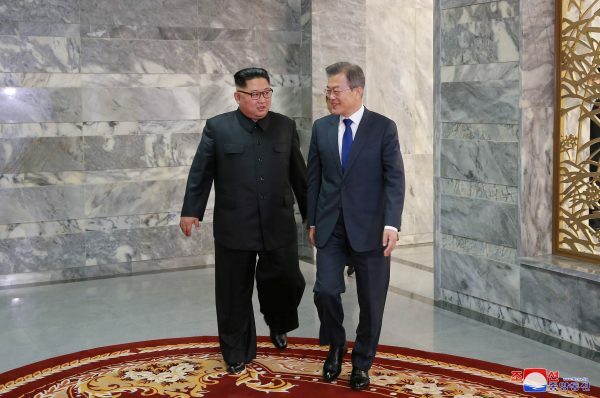 "He (Kim) also expressed his intention to put an end to the history of war and confrontation through the success of the North-US summit and to cooperate for peace and prosperity", Moon told reporters, adding both he and Kim agreed to meet or talk in person "if necessary". Seeking a denuclearisation deal with North Korea was a top priority for a leader who came to the White House on a political promise of putting "America first" while withdrawing from worldwide agreements on climate change and Iran. "That hasn't changed. So, we'll see what happens". But Mr. Moon also made clear that any steps to dial back Mr. Kim's nuclear capabilities could come with strings attached.